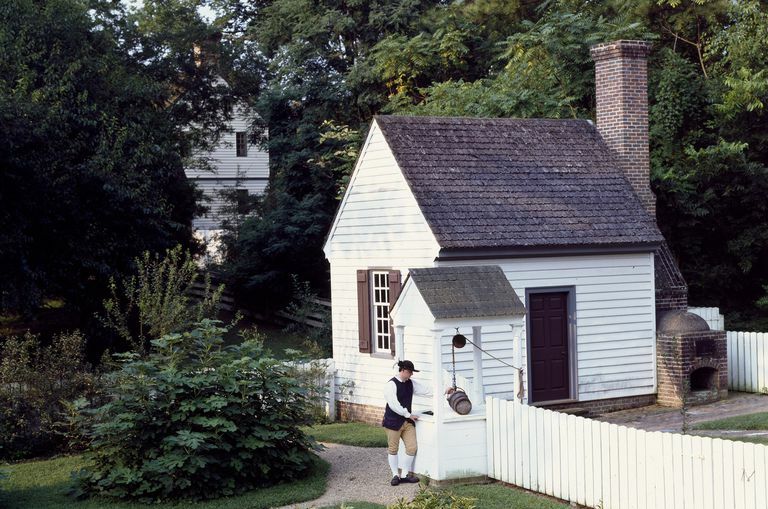 Simply visit Plimoth Plantation or Colonial Williamsburg to discover that one-room, tiny cottages are nothing new. Way back in 1753, a French priest suggested that the Primitive Hut should be the model for all architecture. In the Third Millennium, the authors of these tiny home books would agree. These books are not all about affordable, cozy cottages, but see what can be packed into limited space with these plans and designs. Included are some reprints from earlier times to give the reader context and perspective — nothing is really new when it comes to building small, affordable homes. If you know nothing about living in less than 400 square feet, an Idiot's Guide may be the best starting point. This 2017 book is not filled with house plans, but the authors Gabriella and Andrew Morrison are experienced hand-holders. Author Phyllis Richardson has given us 40 ways to be ingenious and responsible, at under 650 square feet. "Simple Homes, Cozy Retreats, and Energy Efficient Possibilities." More than just a collection of photos and floor plans, Litttle House on a Small Planet offers advice and inspiration with a friendly dose of philosophy. The pictures and plans focus on practical ways to rethink your need for space, and suggests rebuilding, remodeling, and redecorating solutions to use space wisely. What makes a living space ecologically sound? Authors Cristina Paredes Benítez and Àlex Sánchez Vidiella give their points of view on small and not-so-small modern house designs. A book that inspires the realization that one CAN live in less than 500 square feet? Author, editor, and moonchild of the 1960s, Lloyd Kahn helps us dream. Kahn quit the insurance industry to get back to nature, build simple structures, and helped publish The Whole Earth Catalog back in 1968. He's still at it. This book is not like the glossy developers' catalogs of planbooks for one-story homes, but Lloyd Kahn does take you back. Even before the tiny house movement, the U.S. Department of Agriculture was helping people live affordably small. This 1972 Dover Publication is still relevant. Subtitled, "Complete Working Drawings and Specifications for Eleven Homes Suitable for Year-Round and Vacation Use, With Step-By-Step Construction Information," this book is not all about tiny, but it is about building a place of your own. What more could you want? Do-it-yourselfer Jim Marple has created a series of designs for simple, small homes. He walks you through the building of Plan 53, with framing details and a can-do attitude that helps you construct a 385-square-foot one-bedroom cottage. This Dover Publications Reprint presents 500 small-home designs of the 1920s as they appeared in a major architectural publication of 1923. Many are designed by leading domestic architects of the period. Compiled by Henry Atterbury Smith. "The Sears, Roebuck 1926 House Catalog." A vintage house plan collection showing interiors and fixtures in great detail. Sears Roebuck and Co.
"Insights and Ideas for the New American Home." Sarah Susanka, a LIFE Magazine Architect of the Year, shows how homes can be designed to feature "adaptable spaces" and how to create the illusion of space. Michael Janzen's 2012 book has over 200 floor plans for tiny houses, and it's said to be only Volume 1. "The idea of the book is to give you an idea of what fits inside a tiny house," Janzen says in a video walk-through of the book, "and as the size increases, it shows you the additional functions and features that can be included like a washer and dryer, a larger kitchen, bathtubs, sleeping for more people...." As a non-architect, Janzen fully shows you what can be accomplished with software to draw a simple floorplan. The word "small" is relative, and author Christian Gladu of The Bungalow Company defines small as under 1,800 square feet. But if you're a fan of the Arts and Crafts Style, the extra size may be worth a look. This slim, attractive book doesn't have detailed building plans, but you'll find inspiration from color photos of thirty small-scale residential projects, most under 2,000 square feet. Subtitled Innovations in Small-Scale Residential Architecture, James Grayson Trulove edited the 1999 book, which seems to be regaining popularity. How can small be such a big topic? Author and builder Dan Louche has made a "cottage industry" of building tiny homes and providing the plans for do-it-yourselfers. His website at https://www.tinyhomebuilders.com/ let's you buy plans directly from him, but there's nothing like a nice warm book to get you thinking about what's possible. Subtitled "Frank Lloyd Wright's Solutions for Making Small Houses Feel Big," author Diane Maddex reminds us that thinking small has long been a big idea. When thinking about the needs for your own home, return to master architects like Frank Lloyd Wright, who designed rambling open interior spaces as well as compact living areas. How did he do it? Remember to build small but design big.